for March 27th are Sorrowful. R. I came to All Saints Church before a beautiful Monstrance of gold that contained Our beloved Savior. He was adorned in light, the altar beneath shone with the brightest light and the cross behind was entirely silhouetted with the same celestial light. I was overwhelmed with the presence of God and cried deeply from the awe of it all. To be so aware of the Almighty God truly present in His splendor and glory—to know the presence of God, to see the glistening of the gold and the light and reflection of the cross behind Him—my beauteous love—words do not exist to describe the rapture of a heavenly embrace! I cry because of the immense awe within my being to know Him. God truly present in His majesty and glory and oh, God, I behold the presence of a heavenly court. You opened wide the heavens and lifted up the veil and I knew You in Your splendor and glory. I behold God, Father, Son, and Holy Spirit. "I am the Way, the Truth and the Life." He is the Almighty God. He shows us the celestial lights with which He will light this earth. Many must surrender their hearts to His Heart and Mary's heart. It is in surrendering, the Spirit will move in the hearts of men and the light of God will shine on the darkened earth. Not with a light that you comprehend, but a light that is divinely granted—a light beyond all lights, a vision beyond all visions. It takes the surrender of minds and hearts to God. The Spirit cannot move in us when we are in control. Surrender and give Him our heart and He will make us fishers of men. We are His apostles in the Shepherds of Christ Movement. He is sending us out into the world to light the hearts with His burning love. We are chosen by Him and He is giving us abundant graces to grow in our union with Him. He will light this world with His burning love. Our hearts must be open. We must surrender and let go and reach beyond the senses, reach with our hearts. Pray for faith, pray for the vision of God. Note: I cried all through this writing, having the presence of God and being in great ecstasy to behold Him. May God touch your heart and may His Spirit move within you. May you be filled with the grace of God to surrender and let Him accomplish a great work within you. And I was filled on high with His miraculous light and He reached down and spoke within me. I was filled as never before and knew the presence of God, Father, Son, and Holy Spirit. Note: As I finished, the bells at All Saints Church rang at 9:00 A.M. As I began to experience the immense splendor, the bells of 8:00 rang. Words do not express anything that I saw or experienced or know from this ecstasy. This was the greatest and the first of three visions, which defined clearly to me our role in the Shepherds of Christ Movement. Jesus defines clearly the role of Fr. Carter in this great mission given to him by the Father. To him who has eyes to see, they will see - not with earthly vision, but with the eyes of faith, and to him who has ears to hear, he will hear with the fluttering of the Spirit moving within him. I am the Way, the Truth, and the Life. I am the Almighty God. I say to the rocks to fall and they fall and to the grass, grow, and it grows, and to the sun, shine, and it shines. I give to you My love in these letters. Filled with My love, you will conquer this earth, not with weapons and powder or force, but with fires of My love. The fire will wipe out the hatred in the cold hearts and the earth will be covered with My celestial light. The earth will rock and I will appear in the heavens adorned in power and glory and the contrite hearts will be saved. I came to separate the sheep from the goats, the light from the darkness. I come and no one pays Me heed. To you, My beloved son, Father Carter, I have sent you on a mission to spread this fire that will cover this earth. The hearts of men will turn from their sick and desolate ways to hearts gentle as a little lamb. There will be one flock and one Shepherd and My staff will rule over all. Hearts consecrated to Our Hearts will lead the light across the earth. This light will be a light of intense brightness, brighter and hotter than any light from a flame. It will be the fire of God's love. The Spirit will move in the hearts of all consecrated to My Heart, and you will know how fire truly spreads, for the love of God is a fire. It is vibrant. It is encompassing. It is smoldering, burning deep within and speedily spreading on the outside. No fire on this earth can ever describe the burning embers that burn from the Sacred Heart of Jesus. No fire burns like the fires coming from My Heart and hearts filled with the love from the Sacred Heart of Jesus. I have written your name, Fr. 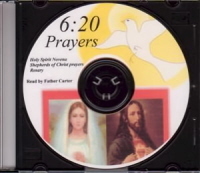 Carter, in My Heart, never ever to be blotted out and this earth will be renewed with the fire of God's love through you. 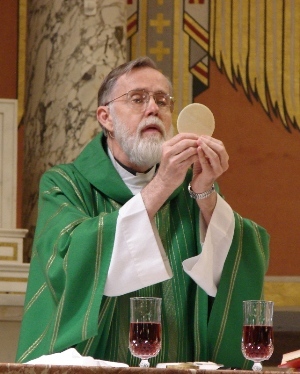 You are My beloved priest-son, forever, according to the order of Melchizedek. 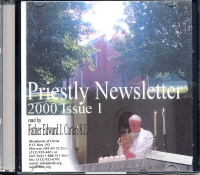 Most holy and most sacred are your hands that consecrate the Host and write My precious newsletter for My beloved priest-sons. You are never unguarded. You are held within the deepest chamber of My Heart, and you will spread My love to the priest-sons of this earth. I am Jesus. You will spread My love to all souls on this earth. I love you with the tenderest burning love. I am Jesus, your beloved Savior. Jesus: I want you to love when they persecute you. I want you to surrender and turn your heart into a heart fixed only in love. Let go and let Me In. I will fill you with forgiveness and love! You must dismiss all fear and realize you live for love of Me and Me alone. I am catching you in My loving arms when you let go. It is hard to love when someone has hurt you. I tell you to forgive 70 times 7 times. Forgive, My little one. Let go and I will embrace you in My loving arms. You have no room in your heart for any hatred or anger. You are tender from My love. Now that you know a little how My heart hurts so badly, your heart becomes more tender! My heart is full of love, love of you. You need no person's approval. You love Me with all your heart! I love you with a heart on fire for love of you. You can love the unloving because I loved you first. I am Jesus Christ. Mine is the tenderest of all hearts. I come to you with the deepest love. Suffer My Passion with Me. My heart was full of love and they whipped Me and beat Me, the tenderest of all hearts, full of love for them who beat Me! I love you, sweet one, with My Godly love. I am all you need. I never change. I love you unconditionally. I love you the same each day. You learn such lessons in your trials. I am Jesus. I am here and I am your Savior. When they persecute you and yell anything against you, they did it to Me first and they do it to Me again when they mistreat you. You are never alone. My mother is with you. She walked My walk on Calvary. Even though we did not touch, our hearts were joined in such union! She walks with you the streets of this cold, self-centered world. She walks with you as you walk toward heaven. She is your loving mother. You are her beloved child. Oh, child, let go and fall into the arms of Him Who loves you. They are the only arms that will sustain you, and My mother is by My side.